Over the years, there has been this notion that the NHL goes to all lengths necessary to protect Pittsburgh Penguins captain Sidney Crosby. The notion was further pushed Monday due to comments from New York Rangers head coach Alain Vigneault. First, I'll give you some context. Credit to newsday.com for this. "Midway through the first period, Simmonds turned and threw a gloved left hand to McDonagh’s jaw after the defenseman high-sticked him in the back of the helmet in a first-period altercation away from the puck. Simmonds received a match penalty, which triggers a suspension until a review, was ejected, and also received a game misconduct. Simmonds was not disciplined further and played against the Capitals on Sunday, so the review must have determined that the in-game penalties were sufficient. McDonagh received two minor penalties, left the game, was examined and held out the rest of the game for precautionary reasons." “I had a feeling he [McDonagh] had a concussion,” Vigneault said. “We weren’t 100 percent sure. He had some symptoms. What I didn’t expect was the reaction from the league. An All-Star player gets sucker-punched, goes down. I wonder if that’s [Sidney] Crosby, what happens? What are the consequences?" This is where the hilarity sets in. It would seem Mr. Vigneault actually believes there would be further discipline to Wayne Simmonds if the victim were Sidney Crosby, not Ryan McDonagh. First off, let's give a recent example of Crosby being abused at the hand (or stick) of Columbus Blue Jackets' Brandon Dubinsky. Not only did Dubinsky cross check Crosby twice from behind - once on the back, again on the neck which puts Crosby down on the ice - but Dubinsky takes it upon himself to cross-check an incapacitated Crosby a third time, breaking his stick in the process. So, I bet Alain Vigneault would expect a 20 game suspension here, right? One. For essentially assaulting Sidney Crosby's neck - directly in front of the eyes of the officials, no less - Brandon Dubinsky was suspended for one game. Wow, they're really looking out for good ol' Sid here, aren't they? Let's look at another example, more within Alain Vigneault's territory. 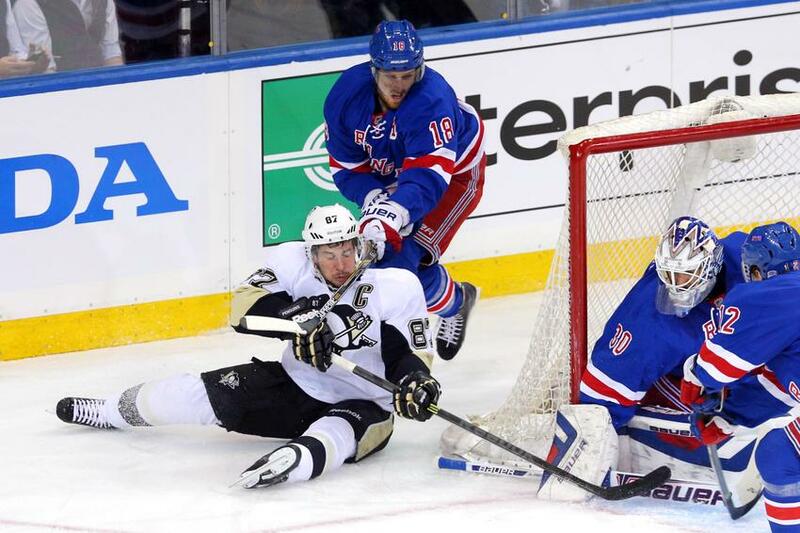 In this instance, Crosby is simply standing in the slot, perhaps waiting to deflect a shot or screen Henrik Lundqvist. Without the puck (quite obviously), Marc Staal decides to cross check the back of Crosby's head because...well, he's Sidney Crosby. The best player on the ice - even if he is slumping - Marc Staal decides the best way to take care of him is cross check the back of his head, even though Crosby has been noted to go through a series of concussion-based issues. This instance is bizarre. There is a scramble in front of the net for the puck, as you can tell by everyone's focus in addition to Henrik Lundqvist's actions (keeping his gloves pressed down to the ice, clearly trying to freeze the puck for a whistle). Sidney Crosby is not in front of the net, but Marc Staal comes in like a flying squirrel and goes for Crosby's head, evident by having to adjust the helmet...why? Now, did either of these instances warrant a suspension or even a fine, Mr. Alain Vigneault? No, no they didn't. It's awfully weird that you'd forget this, since it's been happening for the past two years in the Stanley Cup Playoffs. Right. In. Front. Of. You. Right in front of him. What does this look like, Alain? Quite frankly, the implication that the NHL makes any attempt to protect any of their stars is reaching, quite honestly. All in all, the myth that the NHL goes out of its way to protect Sidney Crosby is just that: a myth. Let's not forget about the sucker punch to the mouth from Zdeno Chara in the playoffs a few years ago. Crosby with a broken jaw, play was over, punched right in the teeth. No penalty, no suspension, no mention of any of it. This league is a joke. Crosby is too good of a talent to chance losing him to a cheapshot.